Soak the Dried Chickpeas for overnight and fava beans for 2 night, Drain it, rinse and dry. Combine all the ingredients except oil and pass it through a food processor for two times to get a smooth texture. Or it can be blended also in the blender. Make the mixture into ball and slightly press with the hand (palm) to flatten. 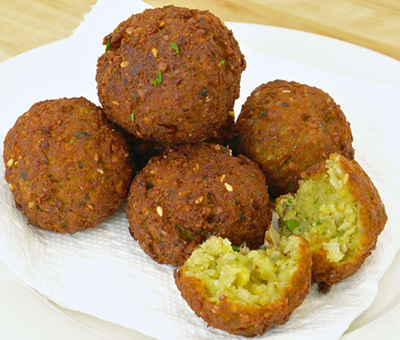 Heat the oil in deep fat fryer and fry the falafel till golden brown and serve.